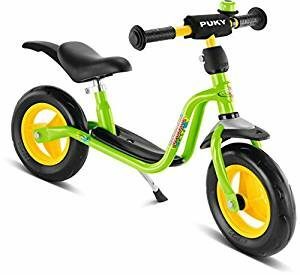 Puky balance bikes come in a range of different sizes, and with over 60 years of experience this German brand can be relied upon to produce a good quality and reliable bike. Puky balance bikes are well known for their child friendly, step through frames on most of their models and they also feature particularly child friendly ergonomics. This guide will review the range of Puky balance bikes in detail, so to get started on this leading brand we have produced this easy to view table which shows each model, the suitable range, the size of bike and distinguishing features. With fresh designs for 2019 and bikes starting from those suitable for two year olds, there should be something for everyone! The Puky LRM Learner bikes are the smallest bikes in the range and are suitable for the youngest children who are just starting to learn to ride to build their confidence and co-ordination. One of the main features of the Puky LRM Learner Bike is the low platform, as this makes it ideal for the smallest of bike riders, allowing them to rest their feet as they scoot along. Another excellent feature of this bike is the special learner bike saddle. This is height adjustable with the lowest setting at just 29cm, which is one of the lowest saddle heights on the market and makes the Puky LRM Learner Bike especially suitable for 2 year olds. The saddle can be adjusted right up to 40cm, so it has a great range and can grow with your child. We have prepared a separate guide for the best balance bikes for 2 year olds, and the Puky LRM Learner Bike is featured here as the low platform and low saddle height make it an ideal bike for this age group. 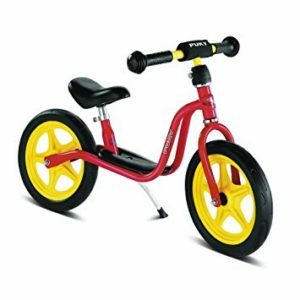 If you would like to look at an alternative, then a competing bike in this category is the Weeride First Balance Bike. This bike also offers a low platform and step through frame, but the lowest seat height is 31cm which makes it more suitable for slightly older children. 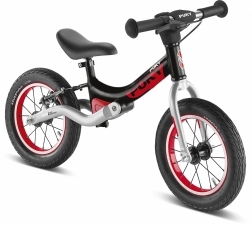 Other features of the Puky LRM Learner Bike include safety handlebar grips, soft luxury foam tyres, a height adjustable handlebar and ball bearing wheels and steering. It is also one of the most lightweight learner balance bikes on the market and weighs in at just 3.5kg – so it is easy to transport and carry around either in your car or by hand if and when your child gets tired of riding. The Puky LRM Learner bike makes an ideal first balance bike and is available in four different colours including ocean blue, lovely pink, red and kiwi. It is available now from around £55 - £60 so this is a similar price to the Strider 12 Classic and a great option for a mid-range bike. The Puky LRM Push Learner Bike has the same dimensions as the base level Puky LRM bike, but offers extra features such as a kickstand, mudguards and a bell. The extra features mean that the Puky LRM Plus is slightly more expensive and you should expect to pay around £80 for this bike. One addition that we really like is the kickstand which prevents the bike being thrown to the floor at every opportunity! The Puky LR1 Learner Bike is the next model up, and although it has a similar appearance to the Puky LRM Learner bike it is more suitable for slightly older children. We talk a lot about saddle heights on this website, and this is because the height of the saddle is one of the most crucial elements to consider when choosing your bike. The lowest setting for the saddle on the LR1 Learner bike is 34cm, as compared to 29cm for Puky LRM Learner bike so this means the bike will probably be too big for most children who have just turned 2 and this is the standard model of balance bikes for 3 year olds. The Puky LR1L Learner Bike is another model offered by Puky. The bike is the same size as the Puky LR1 Learner bike, but a significant difference is that this bike has pneumatic tyres rather than the foam tyres of the LRM and LR1 bikes – this means that the bike has an appearance more like a ‘real bike’ and the pneumatic tyres generally provide a more comfortable ride. This is a great bike for 3-4 year olds and is available in several colours including ocean blue, lovely pink, red and kiwi. It is slightly more expensive and prices start at around £75 but this still provides great value for an excellent bike from one of the leading manufacturers around. Brakes can be useful on bikes for slightly older children, who will have more confidence in their riding and may require a brake if they build up a significant speed. 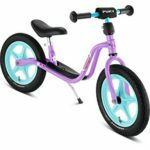 Puky caters for balance bikes with brakes with the Puky LR1L BR Learner bike. This is a bit of mouthful, but essentially offers all of the features of the LR1L bike but with the addition of a rear brake drum. This means that the low platform, pneumatic tyres and height adjustable saddle starting at 35cm all come as standard with this bike, so we think it is really worth considering for children confident on their feet and who may have some prior experience of riding. 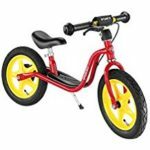 If your child is taller or is starting to ride balance bikes at a slightly later age, then the largest bike in the Puky range may be suitable for you. 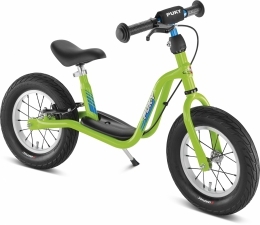 This is the Puky LRXL, which is the biggest model in their range designed for children over 95cm that are not yet ready to ride a normal bicycle. The Puky LRXL comes equipped with all of the features of the smaller bikes, but has a higher saddle with a range between 41cm – 51cm. The step through frame is still featured, along with the safety handlebar grips, the rear drum brake, kick stand and pneumatic tyres. It is generally available in black or green and is a bit more expensive at around £110. This is a very different bike to most of the other models in the Puky range, as the design is completely different with an aluminium frame and a host of top quality features. The low platform that is featured on all of the other Puky learner bikes is replaced with an aluminium fork, and the quality of the ride has also been improved with rear wheel suspension and Aheadset steering. This bike looks superb with bi coloured aluminium rims, a handlebars pad and no detail has been spared with impact resistant powder coating. The carry handle which is attached to the saddle is also a neat addition. The Puky LR Ride is suitable for children from 90cm with a saddle height ranging from 38cm – 48cm. The aluminium frame also keeps the weight down on this bike to just 3.9kg. All of these quality features come at a price and the Puky LR Ride retails from £160. Your child will want to look good when they are out exploring on their Puky balance bike, and there is a range of accessories designed to complement the bikes. 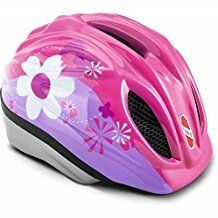 The first accessory you will probably need is the safety helmet in case the rider takes a tumble – these look really stylish and will get your child used to wearing a helmet when they graduate to larger bikes. A helmet will set you back around £34.99, but it is well worth the investment and they are available in a range of colours. Other exciting accessories for your Puky balance bike include a safety bell, a handlebar basket and a learner bike bag that has a built in carry strap. 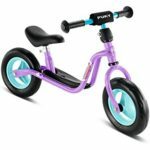 Puky Balance bikes are robust, stylish and although they may be slightly more expensive than other models on the market they are built to withstand use by energetic small children and have a high resale value when you don’t need them anymore. We think the Puky range is a great choice when you are looking for your best balance bike!